By 1800 Kiev time, pro-Russian militants have violated a cease-fire 28 times. Since the start of 18 January, the militants in Donbas have violated a cease-fire 28 times. They shot at the positions of Ukrainian servicemen with all types of weapons, including those banned by the Minsk agreements. The press centre of the antiterrorist operation (ATO) HQ has said that the separatists fired with an infantry fighting machine, an anti-aircraft system and a grenade launcher on Ukrainian strongpoints near Starohnativka in the Mariupol sector. 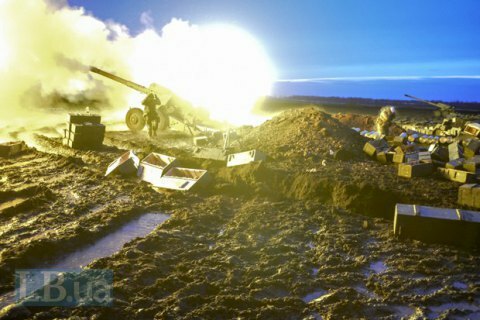 Mortars were shot at Ukrainian servicemen near Lebedynske and 120-mm mortars near their positions close to Vodyane. In the Donetsk sectors, the extremists shot at the ATO troops with grenade launchers and heavy machine guns. They also opened fire on strongpoints near Opytne, Pisky and the Butovka mine. Near Krasnohorivka, the ATO troops were shot at with an anti-tank gun and mortars. An infantry fighting vehicle shot at an ATO strongpoint near Luhanske. In some areas, the ATO troops were forced to return fire. Earlier, Ukraine called on the West to slap Russia with sanctions over the recent aggravation in Donbas.